Today I have another empties post for you. Afrodita Cleansing Foam - It was my favourite for years (you can read about it here), but now I discovered that Balea Washgel works even better for my skin and it's cheaper. Bioderma and Avene samples - I always had samples from this two companies, because my grandfather worked in a medical field and always brought me some samples from them. I have always liked them, but I have never purchased anything from them myself. Afrodita Aloe Vera Creme - Also a favourite of mine for years (read more here). Nivea - Good old Nivea. This one I sometimes use on my legs, because it moisturises very well. 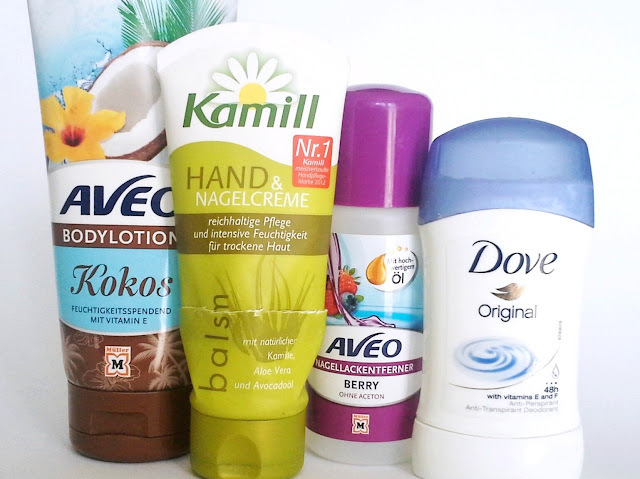 Aveo Kokos Bodylotion - At first I loved the smell of this bodylotion, but already after a couple of days I got bored of it. But I still used it up, because I don't usually like to throw away things if they aren't empty. Kamill Hand & Nagelcreme - I loved this one! It moisturises my hands very good and leaves them soft. Dove Deodorant - I repurchase this everytime, that's how much I like it. Labelo Lippenpflege - I recently found a bunch of this Labelo lipbalms all around my room. I throw them all away. And then when I was cleaning my room again I found more of them! I asked my mother and she said that I was crazy about them when I was little, I wanted to have all the colors haha! Essence Eyeliner Pen - My perfect eyeliner. I stick to it, because it's cheap and it works great. It makes a fine line, which I like. 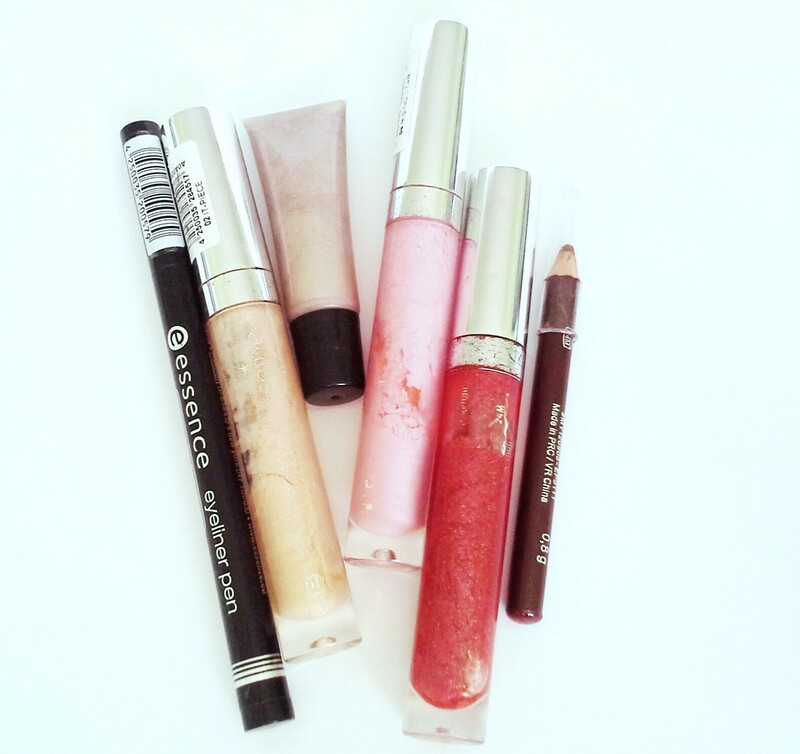 Essence Lipglosses - I don't even want to know how old are these, probably around 4-5 years. I found them, when I was cleaning my room. I remember that I didn't use them much. 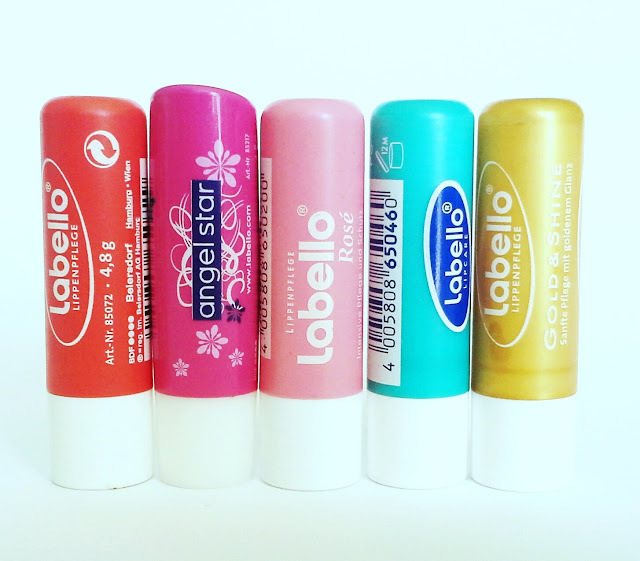 This ones are one of my first lipglosses and one of the lasts haha, I just don't like wearing lipglosses. Ramdom Lipgloss and Brow Pencil - I don't know where this ones are from, again I found them when I was cleaning my room. I didn't use them. 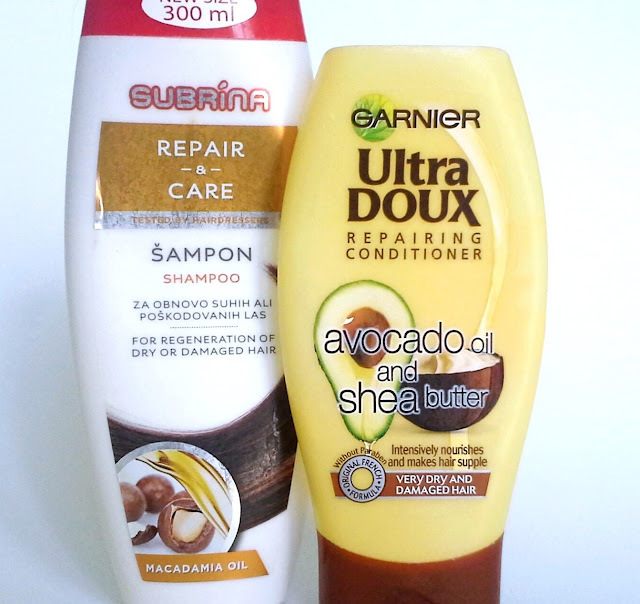 Subrina Shampoo - I used to love this shampoo, I still have a bottle or two at home, but I much prefer the Afrodita one. Garnier Avocado and Shea Butter Conditioner - I talked about it here. 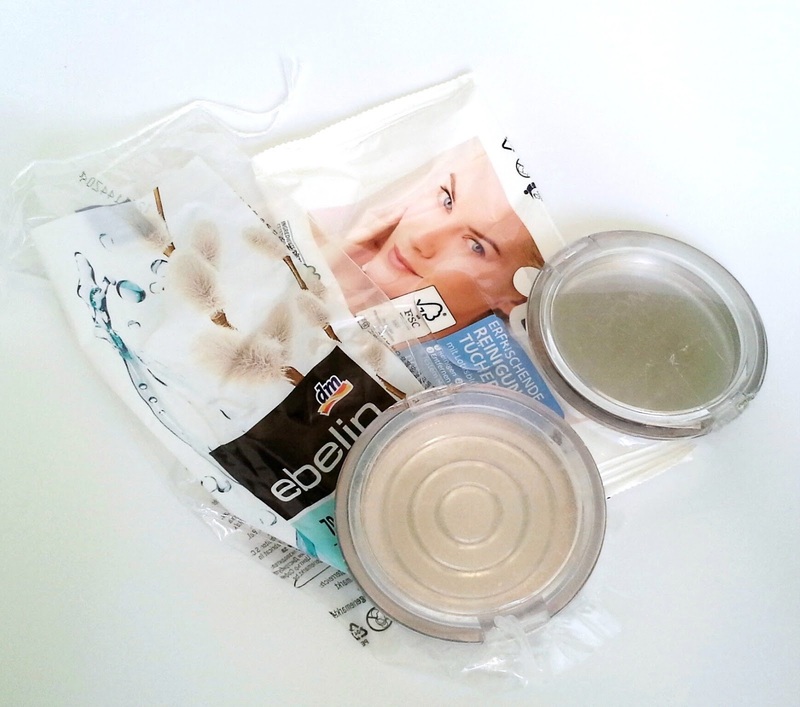 Ebelin Wattepads - They remove makeup and also nail polish very well. Balea Erfrischende Reiningunstücher - I have have used them for a long time, but I thing they irritate my eyes a little bit, so I stopped using them. Essence Powders - My favourite powder of all time. It is cheap (around 4€?) and it mattifies my skin for almost a whole day. I already purchased my 4th or 5th one. S-he, Vollaire Joy Nail Polishes - First s-he nail polish lasted me around 3-4 years, unbelievable! I much prefer their older polishes, I still have some of them and they are still great! But this new one on the right (turquoise) didn't lasted even for half a year. Vollaire nail polish I also have for a long time and it dried out. 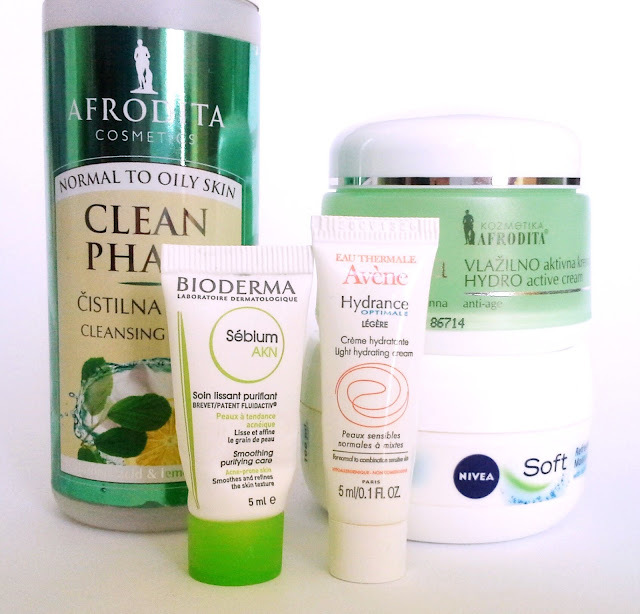 Avene belongs definitely to my favourite brands! Jaz tudi uporabljam tole čistilno peno od Afrodite in mi je top :D Sicer pa tudi sama ne maram lipglossov. Imam jih nekaj ampak res redko posežem po njih. hey! I really like your blog and pictures here are amazing :) Would you like to follow eachother on GFC?